Summer time, holiday time, time for yourself. Departures time and packing time. For this new tour through our summer suggestions we took inspiration from that pre-departure trepidation, recurrent on this season, typical of those days preceding the long-awaited holiday. We imagined our clothes going on vacation, putting them into different hypothetical luggage. It doesn’t matter which will be your destination. A relaxed evening at the sunset on the seashore or a more reckless backpacking day in the mountains, a walk through the ancient splendour of a city of art or a crowded afternoon in the streets of a modern metropolis, we tried to adapt our choices to different holiday scenarios in order to make the clothes good traveling companions in every journey you will decide to embark on. As well a chance to mix up for you the items on sale, putting them under a new light and revealing the possible and various combinations. Enjoy it and above all enjoy your holidays! Y’s Yohji Yamamoto calf length fitted at the waist dress in tencel jersey with “Mark Rothko” colours print, slip like shoulder straps, neck opening with net insert, central zip on the back, a small side pocket on the waist. Yohji Yamamoto shoulder bag in smooth cow leather with wool gabardine sides, drawstring expanded, one small pocket at front and one at back, exposed zip closure, detachable buckle adjustable thin strap, cotton canvas lining, inside pocket. Trippen simple flat sandal with one upper strap across the feet and a narrow one at the ankle with velcro fastening. LGR woman’s sun-glasses with shaded grey photochromatic lenses; frame in flexible acetate by Mazzucchelli and lenses by Barberini. Vivienne Westwood Gold Label dress/skirt in viscose with a big orchid print on a black background, elastic at the belt, two side welt pockets, wide and straight line, wearable as a long skirt or a calf length dress. Vivienne Westwood Gold Label short cardigan in knitted cotton and silk, boat neck, sewn as two drawn near knitted fabrics with profiles in relief, open holes on the shoulders and on the sides, a small pocket diagonally sewn on the front, small band hem, tight fit. Trippen high clog with cowhide leather bands and wood sole.covered with non-slip rubber, leather band with velcro closure, heel height 7,5 cm. Blue Yesey hat, 100% straw. Cauliflower Issey Miyake creased t-shirt in polyester jersey, wide round neck, short sleeves. Zucca wide and long cardigan with cotton Norwegian jacquard, three quarter sleeve, V neck, sewn beads with Aztecan pattern on the shoulders, two side small pockets at the hem. 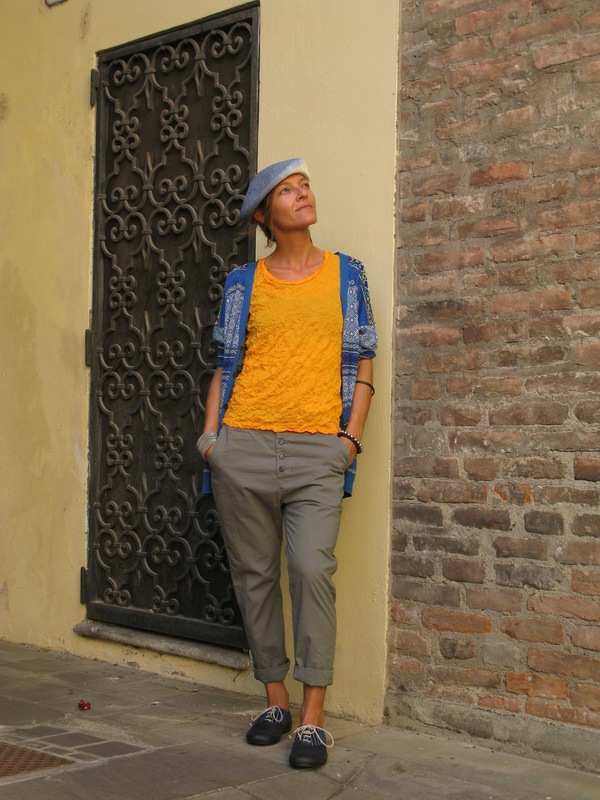 Zucca straight fit trousers in washed cotton poplin., two diagonal pockets on the front and a small pocket with button on the back, stitching in the inner thigh with a “jodhpurs” effect, sewn turn-up at the hem, belt loops. Rosa Mosa cotton canvas pois print and leather sneakers with rubber sole. Comme des Garçons ”sculpture” shirt with overlapping shapes in popeline cotton, medium length, short sleeves with geometric design, wide crew-neck. Forme d’Expression curve shaped skinny pants in black washed wool serge, leg with front curve cut, concealed button fastening, sides slit pocket, centre leg cut and welt pockets at rear, slightly shorter and pointed hem at the back. Yohji Yamamoto doctor style tote in black garment texture soft leather, hinged top, double handles, can be wear on shoulder, cotton canvas lining, , one zipped, one cell phone holder and one slit inside pockets. Tracey Neuls stringless shoes in soft cowhide leather, mocassin like upper with small holes on the tongue and with inner elastic band, leather sole. Scha limited edition hat in vintage quality, very fine weave sisal double layers, soft and ultralight, small brim, pliable wire in the edge. 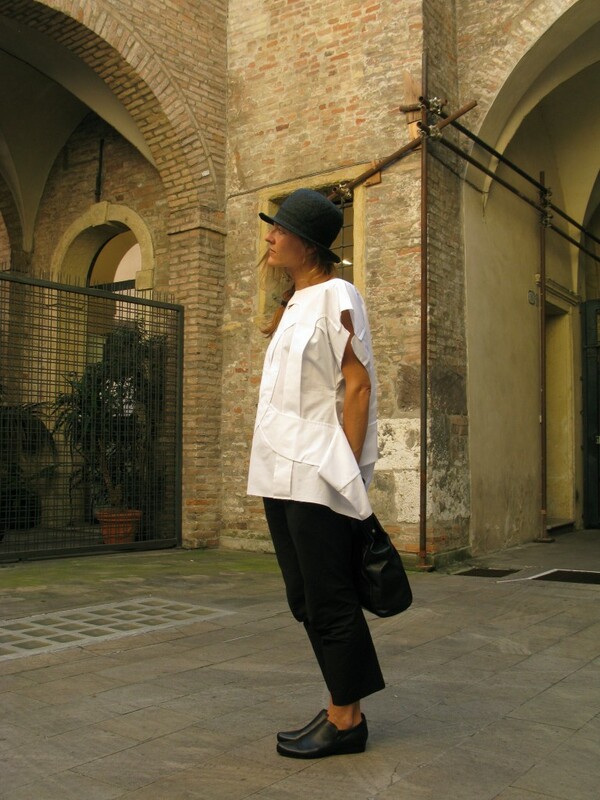 Boboutic wide t-shirt in stockinette stitch makò cotton and silk, falling raw cut short sleeves, wide and reinforced crew-neck, sewn with slight horizontal difference in colour from one shoulder to the other along the back, hem band, shorter at the front. Oyuna sahrouel knitted jersey/crêpe de Chine cotton trousers, side small pocket on the hip, asymmetric line, elastic at the waist, wearable also as a below the knee skirt lifting up the bottom. PLEATS PLEASE Issey Miyake half moon bag in slanting polyester pleating and leather trimmings, an inside small pocket with zip, inside lined with nylon, zip closure, strengthened bottom on the sides, removable handles with hook, cross body, shoulder or hand bag. Trippen flip-flop sandal with classic “Trippen” wide sole and metallic cowhide leather bands outlining a open V on the instep, band with Velcro fastening around the ankle, rubber arch support.